The first thing to grasp is that Chainmail contains not one but three distinct combat systems: man-to-man combat (M2M), 20:1 combat (20:1), and the Fantasy Combat Table (FCT). References to them in the OD&D books were never very clear about which one (or two, or all three) were being called up. Combined with the ACS, you had four very different ways to resolve combat. The fact that they sometimes used overlapping jargon only stirred the mud even more. Our first assumption, and the only one we could be 100% sure about, was that where OD&D and Chainmail conflicted, OD&D took precedence. Even that isn't as easy to put into practice as it sounds; sometimes the house just falls apart unless you let Chainmail take over. 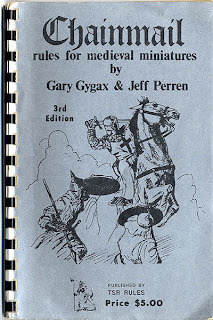 One thing you can do is ignore D&D entirely and play a game of exploration, puzzle-solving, combat, and negotiation using Chainmail's man-to-man combat and fantasy supplement as written. That works pretty well. It probably delivers an experience closer to the earliest proto-RPG sessions than anything else. It clearly isn't D&D, however, and it doesn't resolve the question of the day. Let's assume we've already done that and want to move on to a bigger challenge. What does OD&D actually state about how combat works? D&D's advancement tables contain an entry for the Fighting Capability of characters at each level. These are expressed in terms of "# men (+#)." For example, a 1st-level magic-user fights as 1 man, a 2nd-level warrior fights as 2 men +1, and a 5th-level fighting man fights as a Hero +1 or 5 men. Men & Magic, page 18, states "Fighting Capability ... is a key to use in conjunction with the Chainmail fantasy rules, as modified in various places herein." Men & Magic, page 19, states "All attacks which score hits do 1-6 points damage unless otherwise noted." Monsters & Treasure, page 31, states "Armor proper subtracts its bonus from the hit dice of the opponents of its wearer. If the shield's bonus is greater than that of the armor there is a one third chance that the blow will be caught by the shield, thus giving the additional subtraction." 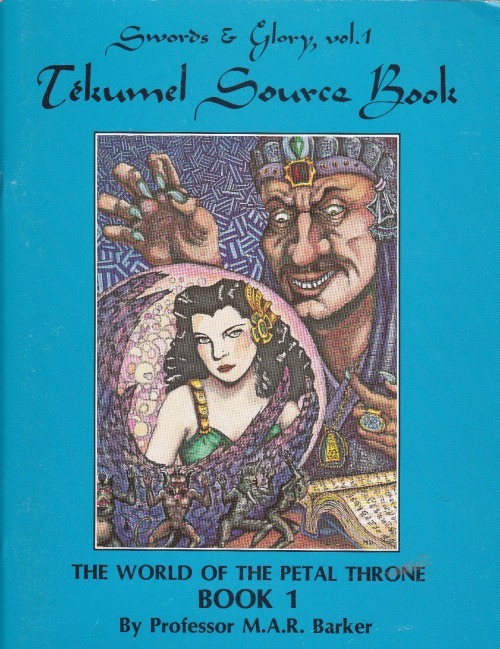 The Underworld & Wilderness Adventures, page 25, contains another big key: "The basic system is that from Chainmail, with one figure representing one man or creature. 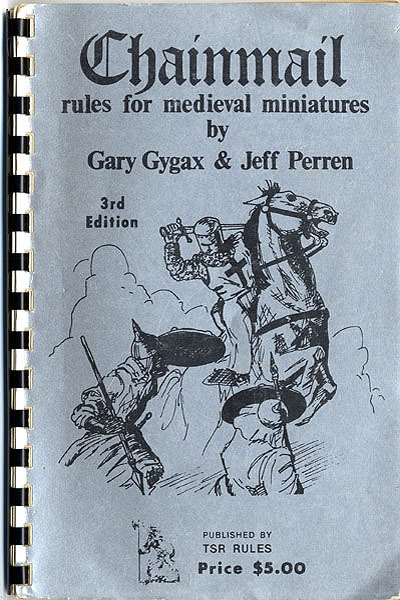 Melee can be conducted with the combat table given in Volume 1 [the ACS] or by the Chainmail system, with scores equaling a drive back or kill equal only to a hit. Battles involving large numbers of figures can be fought at a 20:1 ratio, with single fantastic types fighting separately at 1:1 or otherwise against but a single 20:1 figure." These six points are pretty much everything the OD&D rulebooks have to say about how Chainmail-based combat works. The ACS section adds four more sentences describing how to use the "Men Attacking" and "Monsters Attacking" tables. Things have changed a lot since then. With all of that under our belts, the basics are pretty simple ... but the specifics vary depending on whether you're using the Man-to-Man table, the 20:1 rules, or the Fantasy Combat Table. There was an understanding among my original group of gaming friends that OD&D (and even AD&D 1e) were fundamentally broken. I can see now how we came to that conclusion. How did this confirm an impression of fundamental brokenness? This is very cool, thanks. Coming to white box D&D after AD&D left me completely confused about how to actually play combat. Some of the seemingly extraneous bits being Chainmail didn't occur to me until later, and it's nice to see someone pull it together like this. I love Chainmail combat and its various refinements. I would prefer to use the refined Chainmail systems since they tend to speed up combats. @kesher I didn't mean to say that this post confirmed my suspicions that the game was broken, just that I really understand why the twelve year old version of myself thought that way. Thanks for taking the time to post your thoughts after I bugged you via e-mail. So far I am on track with you. I look forward to the remainder of the post that got munched, where I hope to see your thoughts on monster armor class as used on the M2M combat chart.